Today’s students carry a ton of stuff everywhere — a laptop, textbooks, tablet, water bottles, pens, charging cables, gym clothes, you get the idea. A good laptop backpack is the essential companion for every young academic. In addition, the right one is an extension of your personality and style. When shopping for one, look for a sturdy, water-resistant build that offers protection against the elements. You’ll also want adjustable shoulder straps, a properly ventilated back and plenty of compartments. Some backpacks offer thoughtful features such as reflective accents for night safety and TSA-compliant designs, and some come with lifetime warranties. If you’re looking for the best knapsack for your student, we’ve got your back. We love Rickshaw's Sutro Backpack for its elegantly simple design. It features a 15-inch laptop sleeve, and is available in Steel, Midnight, Coffee and Moss. Your favorite student can travel light or stuff all your belongings in the Sutro, thanks to its expandable barrel. An organizational front pocket helps him keep track of loose items such as pens or notepads, while padded straps with a sternum clasp make sure the backpack is fit well. STM's Drifter backpack offers plenty of pockets so academics can keep a 15-inch laptop, sunglasses, keys, wallet and cellphone in their own compartments. This top-loading backpack features a 3D foam mesh back panel with air-flow channel for ventilation on warm days and a reflective light loop for night safety. A reinforced bottom and water resistant material provide extra protection. We especially like the integrated luggage pass, which lets students strap the backpack onto the extended handle of wheeled baggages. Available in graphite, red and olive. Booq's latest Boa Flow backpack features a collapsible bottom compartment protected by a rigid frame for carefully protecting precious items including a camera, headphones or precious items that shouldn't be crushed. In addition to a 17-inch laptop compartment, a built-in strap hangs keys at the top of the interior compartment. Sturdy, water-repellant construction keeps stuff safe. Plus, a Terralinq tag and serial number can help recover a lost bag. This rucksack's unique striped pattern will turn heads on campus. Hex's Hayward Alliance backpack's water resistant waxed canvas build with padded and fleece-lined compartments will protect precious cargo. Students will be able to fit a 15-inch Macbook Pro, an iPad, textbooks and notebooks easily into the Hayward Alliance without compromising its sleek profile. With a handy front grab handle, the Osprey Comet is great for those who are perpetually late. The backpack sports an AirScape backpanel that keeps torsos cool and a sternum strap and padded straps help secure the bag firmly to your student's body. Easily store laptops of up to 17 inches in the Comet's padded laptop compartment, and keep your paperwork in order in the front organizational pocket. Available in red, grey, blue, green and black. Let sparkling personalities shine with the Peace Out backpack by Studio C. Its eye-catching, colorful shell is matched by a fun polka dot interior will brighten anyone's day. Keep phones within reach thanks to a convenient pocket on the shoulder strap, and store essentials in the handy organizer pocket in front. Students can easily fit a 15-inch laptop in this bag, which packs a padded air mesh back and reinforced, adjustable shoulder straps. Not only is the Timbuk2 Swig Laptop backpack slick and attractive, it also packs a whole bunch of clever features to make your academic's life easier. Accessory loops on each strap let them attach phones or music players for easy access, while an on-strap bottle opener will make sure they're the life of the party. We especially like the Swig's sleek profile that hides a fully padded laptop compartment for notebooks up to 15-inches. 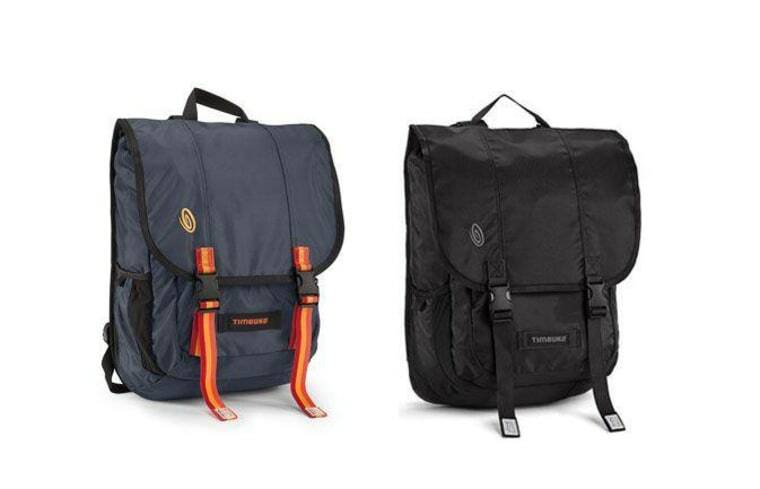 Available in blue, black, pink or custom colors you can choose on Timbuk2's website. Keep belongings extra safe with Eagle Creek's Universal Traveler Backpack RFID. In addition to lockable, self-repairing zippers, it features RFID-blocking technology that keeps would-be thieves from stealing your teen's debit card or personal information with specialized transceivers. The Universal Traveler is also designed to be TSA friendly for quick scanning. Schoolkids be able to carry notebooks of up to 17-inches and thanks to reflective accents, you'll stay safe on the roads in the dark. Available in blue and black. Neatly stow your kid's tech with Case Logic's Berkeley Plus 15.6-inch Laptop + Tablet backpack, which comes in a variety of fun patterns and colors. Dedicated compartments, sleeves and organizational panels keep electronics and accessories in order, while a hidden pocket on the lumbar (back) panel holds small valuables. Grab handles on the top and bottom offer easy grip for overhead storage. Available in Calypso (blue and black stripes), Wasabi, (green and black stripes), Twilight (purple diamonds), Storm (blue diamonds) or Anthracist (brown).